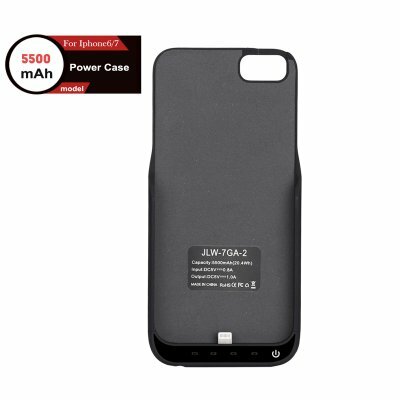 Successfully Added iPhone Battery Case - 5500mAh, 4 LED Charge Lights, iPhone 6 / 6S / 7 to your Shopping Cart. This external battery case will super charge you iPhone 6 /6S or 7 devices bringing it enough addition juice to see you through any power shortages. Designed to fit your phone like a glove this compact case brings much-needed power without adding undue additional weight or bulk to you iPhone. Its quick and easy to install, sliding straight onto the back or your Smartphone - Not only will this stylish case double or triple your phone's battery life, but it will also serve to keep your phone safe and well protected. With 4 LED indicator lights you can see the remaining charge with just a glance. a foldout stand supports the case and your phone allowing you to view the screen hands-free, perfect when playing movies or listening to music. With a USB port on the side of this case, you can even tap into the vast reserves or power to charge up other phones or devices as well. This External Battery Case for the iPhone 6 / 6S or 7 comes with 12 months warranty, brought to you by the leader in electronic devices as well as wholesale external battery cases..